The more I think about it, the more I believe that the links I bookmark everyday are an important dimension of my online life. They're mine to keep. When Google Reader »integrated« several of its Reader's features into GooglePlus, my friend Jan and me made the switch to a self-hosted RSS Reader (tiny, tiny rss, I talked about the switch here). It is an awesome product to manage incoming RSS content for personal reading. 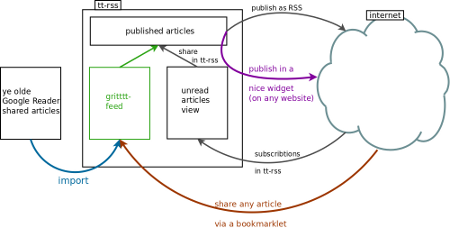 It also gives you the possibility to publish/share an outgoing RSS stream with the best articles from what came in. The little widget in the right lower corner on this website now shows my "shared" outgoing RSS stream in the widget I made. It is not so much about sharing links, not in the first place, that is. I myself want to keep bookmarks of what I read each day. 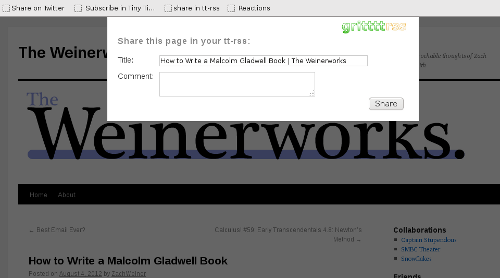 I believe that the links I bookmark everyday are an important dimension of my online life. I bookmark a couple links everyday, and years later I can look back and understand what I was interested in during certain times. Unlike online services like Delicious or Pinboard, however, I host the list of bookmarked links myself - I really own that data. And the method (the gritttt-rss code) is open-source.